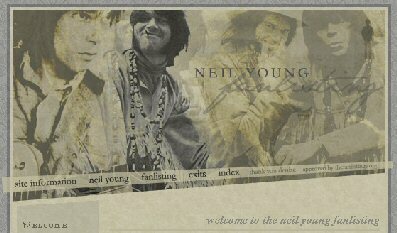 Here's something Thrasher recently stumbled upon, something called Fanlisting for Neil Young. So what's this all about? It's another way for the Neil Young Nation to unite! "I began to listen to Neil Young when my other main huge influence, Bob Dylan was really changing my life. Bob Dylan and Neil Young are really my main two; they're my biggest influences. It was through Dylan that Neil came into my life, and it's come to the point where to ask me what Young means to me is the same as asking me to read my diary to you. Neil touched my life through his love for nature, his gentle words, his soft, delicate to the touch voice and simple imagery that can change your way of thinking." "Starting from the left, we have Neil on guitar, jamming during his early 'grunge revolution' years; during the gentle, protesting Woodstock years, clothed in beads and a flowing jacket; during his relaxing "On The Beach" (1974) years, beckoning us to the beach; lastly we close with him in his Woodstock years once again. Maybe it's representative of something - like his ability to go back and forth in time - or maybe it's just there." Very cool site, Raine. Check it out.